Posted August 2, 2018 by Cultbox News & filed under Headlines, News. Chunks of Doctor Who series 11 were filmed in South Africa, and we’ve only just found out. Jodie Whittaker has been talking up the experience in the new issue of Doctor Who Magazine. 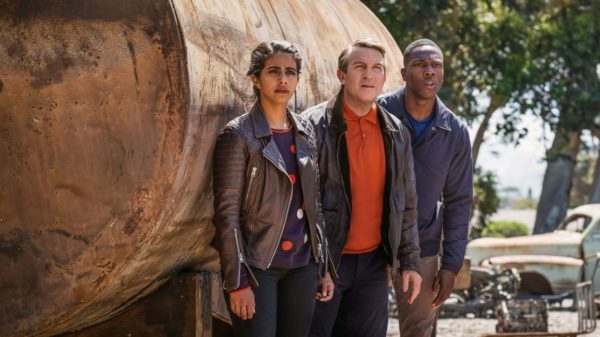 Without the show’s huge online community of fans picking up on it, the Doctor Who series 11 team decamped to South Africa for a number of weeks to film an episode. This, unfortunately, was while a drought was going on. “The Doctor Who shoot was three weeks. It was warm, so that was good,” Whittaker told the fan magazine. “The ambition was huge and the landscapes there – you couldn’t have got that here. “Other than the water crisis, we had a really good time out there,” joked Tosin Cole, who will play a companion by the name of Ryan Sinclair in the new series. We don’t know the story of the South African episode as of yet, or where it will fit in the chronology of the series. We also don’t know whether South Africa playing itself, so to speak, or if is doubling for an alien world or another place on Earth. Speculation on the web has suggested that South Africa could be doubling for the American deep south, perhaps for the Rosa Parks episode. That’s an unconfirmed piece of guesswork, at this stage, but we do like the sound of it. As we hear more Doctor Who news, we’ll be sure to let you know. Doctor Who Magazine issue 528 is on shop shelves now.